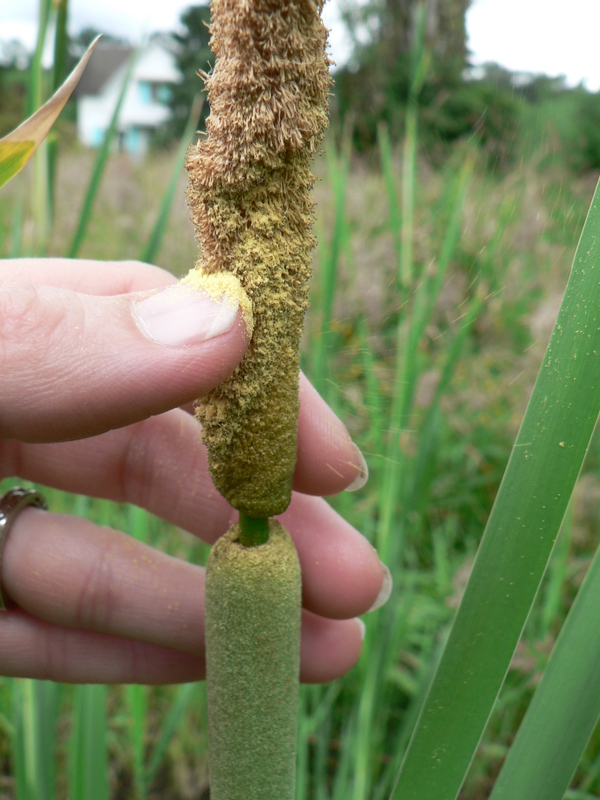 The yellow pollen on top of the seed head from which cattail gets its name. Kim Chisholm. Please click here to read critical introductory material in Top Native Plants To Learn for Herbal Medicine, Part 1 of 2 including the non-flowering plants, and my article on the Tenets of Herbal Medicine. These articles are designed to help the beginner cut the chaff, and start studying plants that will give a solid foundation of knowledge. But it’s not even the whole plant you need to learn: the properties inside the plant are what’s important. To understand that, the best essay I’ve ever found is in the appendix of Botany in a Day by Thomas J. Elpel. If you really want to understand herbal medicine, read his wonderful 10 page essay on herbal properties. Here in Part 2 of 2, my focus continues to be on Pacific Northwest native plants that are either 1) scientifically proven to effectively treat health issues, or 2) personally tested to work for me. Many of them should only be used under the care and advice of a naturopathic physician, so please seek personal medical advice and never rely on internet advice to treat problems. Grasses are perhaps the most important plant to our society, as their seeds are the grains we eat, their leaves the feed for our livestock, thatched roofing material and so much more. See my article on grasses for other uses, but as a medicine, one of the universal beneits of grass is for stomach aches. Just look at cats and dogs, who eat it to cleanse their stomachs. There are many causes of stomach ache, including dehydration, appendicitis, food poisoning, constipation, etc., so to start testing its effects, try wheat grass juicing to see how it effects you. Cattails are probably the most important plant for you to know in survival situations. Take a look at my article on cattails for more information, but as a medicine, the gel found between the leaves seems to be a topical anesthetic (and some say antiseptic, but I’m not sure about that) so I’ve used it topically on a toothache as well as for sore joints with nice success. “Sedges have edges, Rushes are round, Grasses have leaves on stalks to the ground.” There are exceptions, of course, like Tules or “Bullrush” which look like big rushes but are apparently sedges, according to the latest taxometric classification. As for the orchid family including lilies, the native ones are probably fairly easy for you to identify in North America since they are relatively few. In the tropics, the opposite is the case: orchids are the largest family. The author instructing a group of herbal class students on identifying and harvesting willow. Willow species were the source of Salicylic Acid, aka Aspirin, until it began to be synthetically produced in the 1950s. Willow, then, is a great pain-killer for headaches and certain other aches, but cannot be used when a person is bleeding because it thins the blood. To use, just make a decoction (simmer for a few minutes) of the bark and/or twigs, and drink a cup which can be somewhat equivalent to one or more aspirin. Also, remember that aspirin can cause Rye Syndrome in children, so it should not be used for young ones. Plantain species, especially lance-leaf plantain, cure bee stings like nothing else. One of the miracle herbs, just pick a leaf, chew, and spit the green mush onto a bee sting for immediate pain relief. It also draws things out, so don’t be surprised if the stinger is gone the next day and you can’t find where you were stung. Further, since anaphylaxis is a leading wilderness emergency, plantain may be attempted in case nothing stronger like benadryl is available in case of allergic reaction to stings. Finally, remember that the seeds of plantain are called psyllium, which is the main ingredient in Metamusil, used as a laxative to cure constipation. Oregon Grape is another northwest backcountry plant which is anti-microbial. In fact, although it is not closely related to goldenseal, it is used very similarly to treat colds and other viruses. Although you can make a decoction of the roots if needed in the backcountry, making a tincture is probably the best way to draw out the antiviral properties, so I carry some in my first aid kid (which also contains that arnica oil of course) that I made at home. Devil’s Club is considered by many to be the most sacred medicine of our region, and it is used similarly to ginseng which is in the same family. If you have low energy, for instance, make a small, light decoction from its root, and drink a tablespoon to see how you feel later. However, don’t use too much or you’ll be sorry like some of my camp staff did (without permission) during a survival trek a few years ago. Headaches all around:) Really, this plant works strongly on several systems of the body, so it will probably someday have its own commercial asking you to consult your physician about its benefits, and then spend half a minute listing its many side effects! 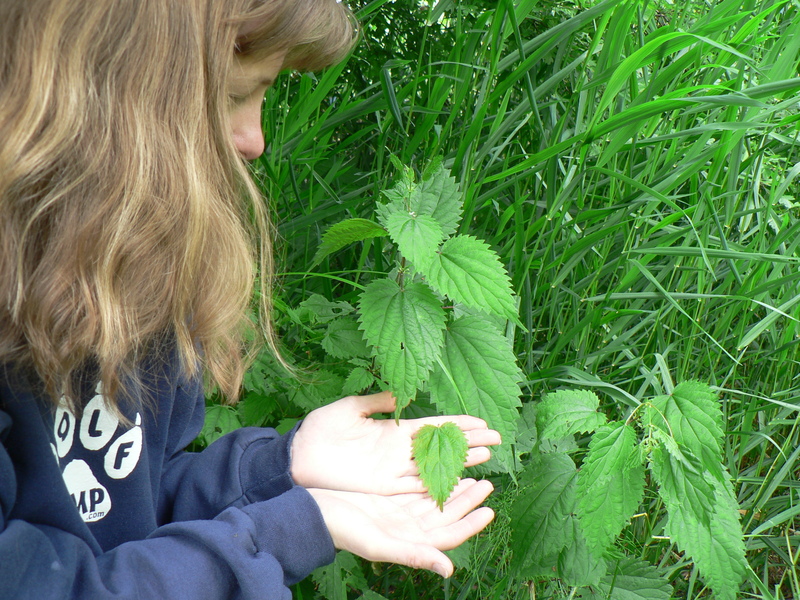 Kim Chisholm showing the characteristic heart shape and serrate edges of a stinging nettle leaf. Nettles are very useful for many reasons, and you can read about their many herbal uses in a fun chapter by Susun Weed in her book Healing Wise, but in the backcountry, their external application (whipping) can stimulate blood flow to cure sore joints, while their internal consumption is great nutrition, especially to treat anemia after blood loss. In the meantime, take a look at my wife Kim’s article on nettles for more information. Arnica species, in addition to being anti-inflammatory, are anti-bacterial when applied to wounds, so they can be a good choice for all kinds of trauma. Used internally, Arnica increases body temperature, so it is good to ward off chills, and induce fever in case of colds. I’ve still never used it straight from nature, so you’ll have to look elsewhere for processing instructions. However, I am planting Arnica in my garden this year, so I’m looking forward to researching it more. Wolf Camp instructor Rachel Edwards with Yarrow she harvested to dry for medicine. Yarrow is similar to Arnica in that it, too, increases body temperature or induces sweating when taken internally, so people use it as a tea (hot infusion) to treat colds and flu, hoping to kill the virus. It’s also good for cuts, because when applied externally, it stops blood flow and helps wounds heal. I just apply the leaves straight on, but I’m not sure how antibacterial it is, so always take care to avoid infection by flushing simple wounds with pure water. Cranberry species grow in bogs amongst the sphagnum moss, and cranberry is a scientifically-studied treatment for urinary tract infections, prevention of kidney stones, and general cleansing of body toxins. I grew up with it, and my mom still sends a bunch out after she and my dad harvest them from our lake in Wisconsin every September. Pineapple Weed is wild chamomile, in the same genus as the cultivated German Chamomile. It can be used in the same way, with a calming effect in case of stress, and a relaxing effect in case of insomnia. Goosefoot species such as spinach, lamb’s quarters and quinoa, contain a relatively high amount of sodium for plants, and in fact, it does taste a bit salty, so for those of you who go overboard drinking all that water that they recommend in Wilderness First Aid trainings, and as a result get massive headaches due to lack of salt, you are suffering from electrolyte sickness. Dandelion and chicory, the latter two being diuretics, might be an option in order to regain your balance between electrolytes (salt, potassium and other minerals) and water in your cells. Red Alder and oaks are great trees to cleanse the skin, as the tannic acids create an inhospitable habitat for bacteria, so if you don’t have any soap, at least rinse your hands with an alder decoction before eating and after eliminating. 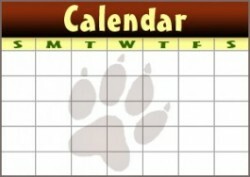 See my article on oaks for more information. 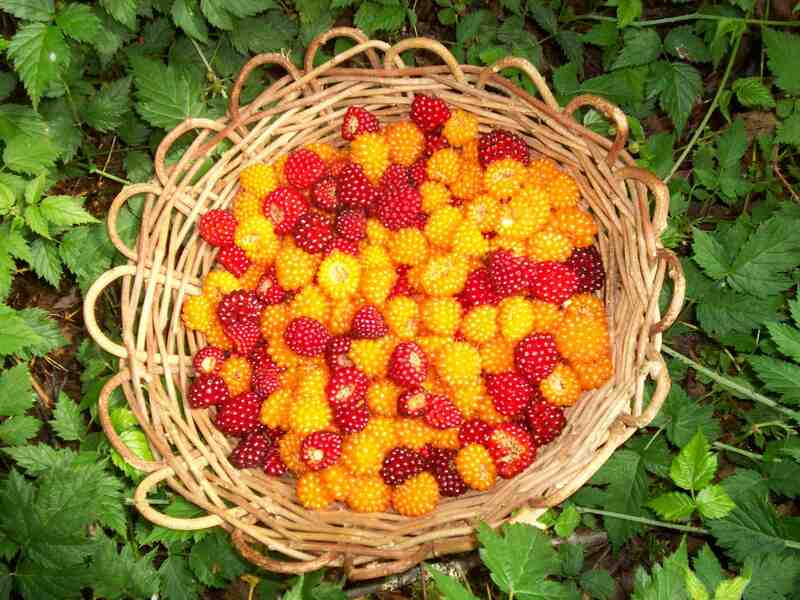 Beautiful Salmonberries in basket made by Wolf Camp survival specialist Andrew Twele. Rubus species, aka blackberries and raspberries, are incredibly useful beyond the sugars and vitamin C provided by the berries. Same for almost all the plants in the rose family to which they belong. Their flowers are also edible, but blackberries and their leaves are also high in iron, so can treat anemia, and leaves are also very astringent, so can treat loose bowels as well. Thimbleberry leaf, I have discovered, cures my hay fever, especially grass allergies. Just blow your nose into the soft leaf, then take another and breathe through it like a particle mask. Take a look at my article on the rose family for more benefits. Elder species are also very important plants, including for medicine in the backcountry. I keep some of its leaves around when I don’t have a tent because it confuses mosquitos. It is also my saving grace, along with chickweed, when I have a flair-up of asthma, which happens after too much exposure to allergens like grass, especially when I didn’t treat those allergies right away by breathing into salmonberry leaves. Elder flowers are the strongest of medicine, and care must be taken when using them, but the fruits are great medicine as well. Just don’t eat the seeds, especially those from red elder, as they are considered poisonous, just like apple seeds. Elder deserves its own article, so do some research, test it yourself, and let me know what you discover! Mint species are great in case you have heat exhaustion, as they have a cooling effect, so just eating a leaf helps, as does a cold infusion (leaves soaked in water), or if you have a headache from heat, you can also rub mint leaves on your scalp. I got sick on moldy mint in the wilderness one time, so it tends to give me headaches now. Therefore, like all these suggestions, test them carefully for personal preferences. Cottonwood is one of the poplar species, which are the source of Balm of Gilead, a mixture of poplar buds and something like bee’s wax to make a salve for rashes, eczema, sun-burn, and other skin irritations. Cottonwood buds are the most aromatic amongst poplars, so we are fortunate to have them. St. John’s Wort also grows along sunny/gravelly patches of our region like along logging roads or fields, and it is a popular anti-depressant, although scientific studies have been totally inconclusive. Try it as a tea in case you are feeling melancholic, especially on dark days, because taken internally, it makes you sensitive to light, increasing sun-burn. What it actually does is effect our nervous system, rather than chemicals like saretonin which are the issue with most depression. Used externally, it ironically has skin-healing properties – actually the nerves under the skin – so I put it in my salves nowadays. Dock. We haven’t talked very much about bowel health yet, and dock species, including Yellow or Curly Dock, and Burdock, like Dandelion, are great roots to eat regularly, to um, keep you regular, with clean intestines. Cascara Sagrada (sacred bark in translation from the latin origin) is an understory tree in our region that was almost logged to extinction (a hundred years ago, before pharmaceutical reproductions) in some places due to its effectiveness as a laxative. So if you have constipation, make a decoction from its bark. Cherry includes a variety of edible and inedible species, but in our area, the Black Cherry has bark/sap that is not palatable. However, it is a very strong expectorant that you’ll find in many over-the-counter cough medicines, but you should consult a naturopathic physician for use, and be very careful in the backcountry to treat wet (productive) coughs only. Mullein is one of my favorite plants during hikes into the backcountry of central washington, and it is another treatment for coughs, but this time, if you make an hot infusion (tea) from its flowers, or a light decoction from its leaves, it should be used to treat “dry cough” in my experience, as it soothes the throat and heals the lungs. Pojar & MacKinnon report that people smoke the leaves, which might be good for wet coughs, so again, it’s best to research, research, research! Pearly Everlasting grows along most logging roads and elsewhere in our backcountry. Its flowers are one of my favorite substitutes for lotion, keeping my skin soft and young-looking:) It blooms from summer through fall, so it is available much of our year. Tansy is a great plant that can keep bugs away if you surround yourself with it, or rub it onto your skin, but like anything, it’s best to check for allergic reactions at home before using any of these plants for the first time in wilderness settings. 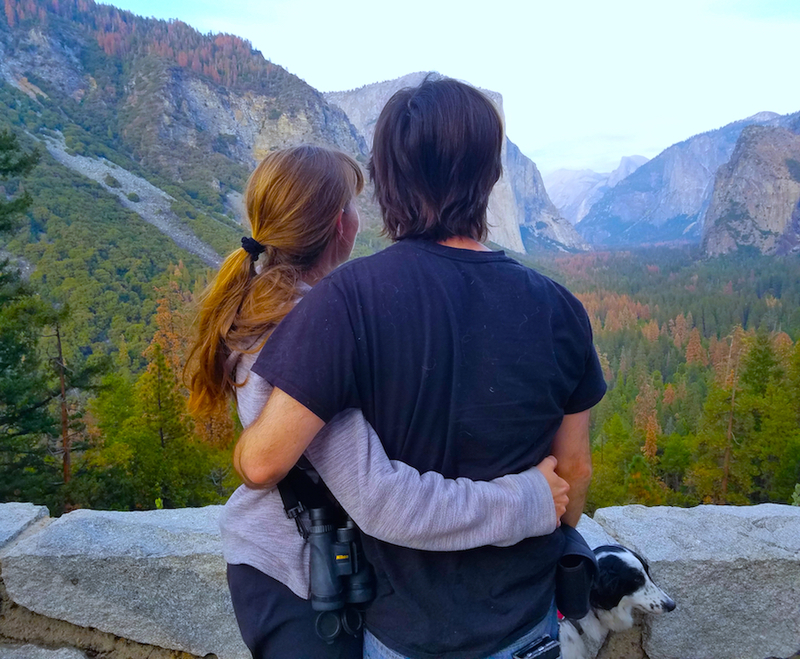 Article author Chris Chisholm is founder and co-owner of Wolf Camp and the Wolf College. 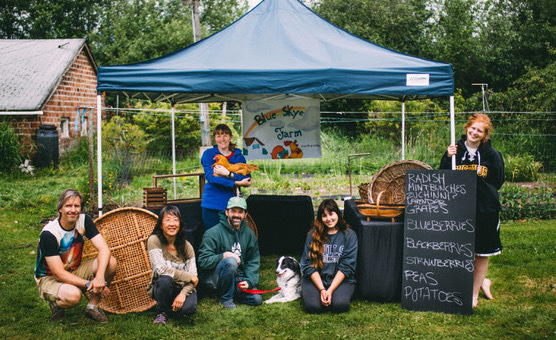 If you would like to practice these skills with Chris and other staff instructors, join any of our March Plant Classes, April Plant Workshops, and summer Wild Ethnobotany and the Herbal Foray expedition or simultaneous youth camp.